Salt Lake City has ranked among the current economic cycle’s leaders for apartment inventory growth. Completions since early 2010 total 22,772 units, expanding the metro’s stock by 27%. But unlike in many other markets, building appears to have already moved past peak in Salt Lake City. Annual completions registered at 2,765 units in 3rd quarter 2018, down from 4,349 units a year earlier. About 3,000 units are slated to come on stream in the year ahead. Salt Lake City’s moderating new supply volume is a positive sign for the metro’s near-term performance prospects. 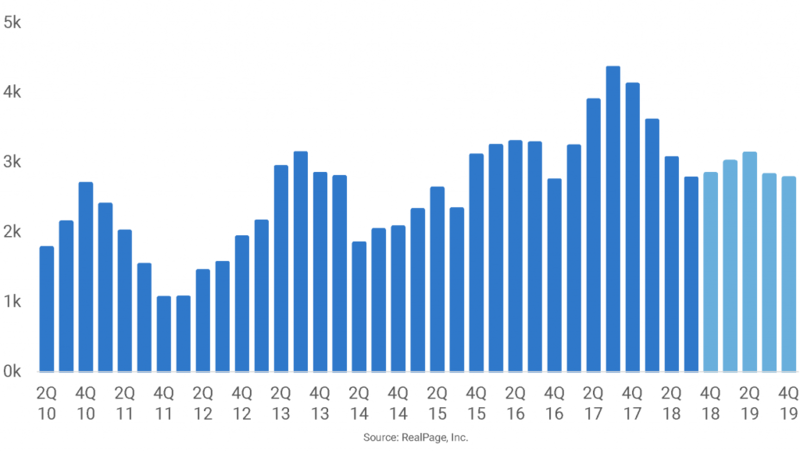 RealPage anticipates local rent growth above the national norm again in 2019. Furthermore, looking across the country’s 50 largest markets, the metro holds a top 10 position for annual rent growth in the RealPage three-year forecasts.